I have a confession: as a child, I watched a lot of TV. I mean, A LOT. God bless the 1970’s – a time when we had a color TV in the family room, and “screen time” was still decades away from entering our vernacular. My sister and I would argue over a beanbag chair because of its proximity to the set, before remote controls became commonplace. PBS was our go-to source for entertainment. My earliest memories are of Sesame Street. The colorful and eclectic residents of that delightful neighborhood provided hours of enjoyment and learning. My favorite parts are still the catchy little songs about numbers, letters and phonemes. I can sing several of my favorites, and I swear that one of them makes an appearance in Hamilton (Ten Duel Commandments, anyone?). I have come to appreciate Sesame Street with a whole new perspective as a parent of young children. I appreciate the clever inside jokes aimed at the adults who were, presumably, watching too (and with absolute giddiness upon the realization that the musical talents of Lin-Manuel Miranda were now leaving their mark on my own kids). As I got older, I branched out to shows like 3-2-1 Contact and The Electric Company. I can still remember how desperately I wanted to be part of the Bloodhound Gang. Honestly, who wouldn’t want to be part of a professional child detective team? The amount of respect shown to those kids for their crime-solving skills was just plain impressive. As times evolved, so did the children’s programming. I fell in love with Reading Rainbow. Hosted by LeVar Burton, and featuring children’s books, which were read on-screen, often by children. This show was great at was capturing the magic of a great children’s book. I was a little too old for the books that were typically featured in each episode, but by then I was babysitting, and would generally insist to my charges that Reading Rainbow was a great way to spend a half hour. Who could argue with that? Around this time, I also became obsessed with a new show on PBS called Where In The World Is Carmen Sandiego? Essentially a game show focusing on world geography, where contestants competed to answer questions and recognize photographs of famous landmarks, in hopes of winning an amazing trip to “somewhere in North America”! I didn’t think very hard about exactly what that meant, but OH MY GOSH, did it sound exciting! Better yet, each contestant got their own detective’s jacket to wear on the show. But my favorite part of Where In The World didn’t have anything to do with geography. It was ROCKAPELLA. Or, as I affectionately think of it now, some serious foreshadowing of what would become my life-long infatuation with the amazing world of A Cappella music. Rockapella was a group of four men who acted as an in-studio backup band for the show. They sang the theme song and all the ambient music to the show and they did it – USING ONLY THEIR VOICES! Their arrangements, harmonies and vocal production were captivating in a way that I couldn’t really put into words at the time. Of all the shows I remember watching as a child, there is one that holds a place closer to my heart above all others. Without a doubt, Mr. Rogers’ Neighborhood made lasting impact on me. I still remember watching, captivated, as Fred Rogers introduced his many friends and neighbors to the audience. Individuals who I would, many years later, come to recognize as Yo-Yo Ma, Julia Child, Eric Carle and Itzhak Perlman. Mr. Rogers’ neighbors were always an amazing combination of talented, smart, unique, diverse, and kind. In fact, kindness was the most central theme running throughout his show. Such simple, yet profound ideas to instill in children. When I look around at the issues we face in our daily, grown-up lives, I am convinced that Fred Rogers’ simple philosophies of kindness and acceptance would go a long way in our world today. When I think of PBS (and our local PBS station: WGBH here in Boston), I am immediately reminded of all these shows that I watched as a child. I have taken bits of each of them with me, through my life, and into adulthood. In many ways, they have become roots of who I am, what I enjoy learning about, and (thank you Mr. Rogers!) what I believe. Fast-forward from my childhood to grown-up me. 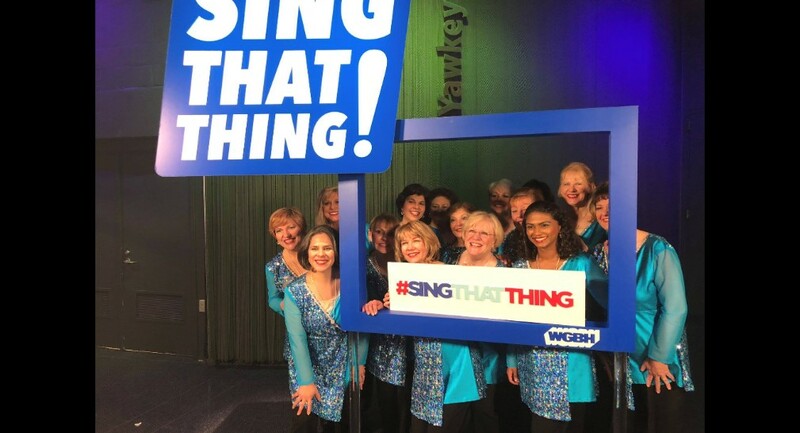 About two months ago, my chorus had the exciting opportunity to go to the WGBH studio and compete on season 4 of a show called Sing That Thing! This show aims to spread awareness of the joys of ensemble singing to people of all ages and abilities. It features 18 different choral groups who perform, receive feedback from a panel of expert coaches and, hopefully, move on to the final rounds of competition. 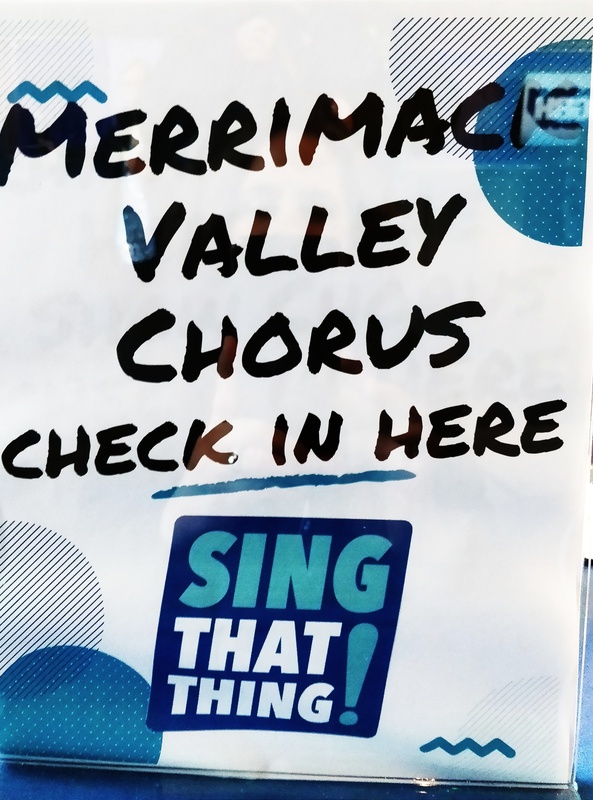 My chorus, Merrimack Valley Chorus, had the immense pleasure of competing on Season 1 of the show a few years ago, so we knew what to expect. On the day of taping, we arrived in full costume at the Brighton studio. From my past experience in Season 1, I remember how impressed I was with the WGBH staff. This time was no different. Like seasoned professionals, they are extremely organized, can answer any question and take care of any situation. So many individuals coming together as a team, functioning like a well-oiled machine – and with an enthusiastic smile. Mr. Rogers would have been proud! It’s amazing. The lights are incredibly bright, everything is very shiny and the energy in that space (even when the cameras are not rolling) is utterly exhilarating. We were given a couple chances to sing our song in front of the cameras. My heart was pumping as if I was standing on the edge of a skyscraper. This does NOT make singing any easier. Adding to the excitement of the studio is all the amazing people: the coaches and live audience were both only a few feet away! I felt like I could burst. Or pass out. Or both. When we finish singing, the coaches are ready to give us feedback. Here’s what I remember: their comments were kind, constructive and incredibly gracious, as if they were expressing thanks to our chorus and I for a wonderful gift we had just shared with them. Also, Anthony Trecek-King, Annette Phillip, and Jared Bowen are three of the most impeccably-dressed people I have ever laid eyes on. They are absolutely dressed to kill. They are also superlatively gracious, smart, and eloquent. Everything you want to believe your TV heroes are in real-life. In chorus-speak, their personalities come WAY across the footlights. And then it’s over. In the blink of an eye, our time filming in the studio is done. It was a blast, all of it, thanks in part to the wonderful staff at the studio and, in great part, to the truly amazing group of women with whom I sing. They make everything fun. 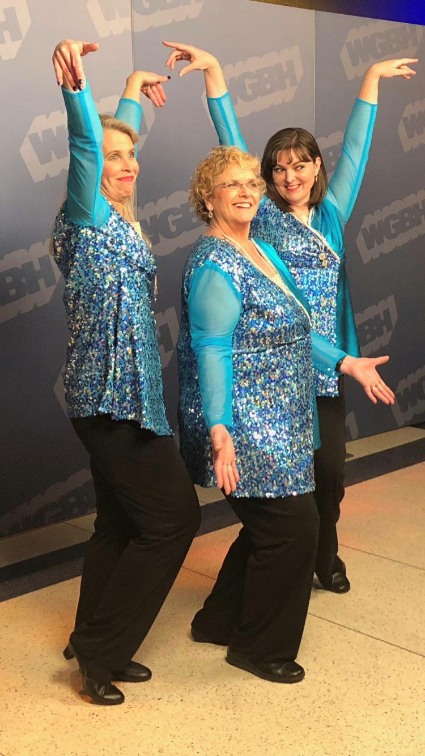 Merrimack Valley Chorus is a group of smart, interesting, unique, talented, compassionate, kind and generally wonderful women. And it’s that thought that reminds me of something from my childhood. In many ways, my chorus friends remind me of the people I met from Mr. Rogers’ Neighborhood all those years ago on my TV. How remarkable is that? So much of who I am as an adult has roots in the multi-faceted and enriched programming I was exposed to on PBS as a child. Suddenly, I arrive at a “Full-Circle” moment for me. I’ve now officially become part of the thoughtful, valuable programming that had such an impact on my younger self. To imagine that somewhere a child might be watching me perform with my friends, experiencing the sincere joy in our music, witnessing the obvious sisterhood that we share, and to know that, I could be part of the seed that gets planted and opens the door to the soul-fulfilling experience that is choral singing. In my own way, I feel like the experience of being on Sing That Thing! has allowed me the incredible opportunity to cross over from a small, impressionable child in my family room, to ACTUALLY BEING one of Mr. Rogers’ neighbors. I cannot tell you what an incredibly humbling honor that truly is. And, so, there’s really only one thing left to say…….